RS232 and RS485 are standards for data cables. To exchange data between nodes on a network, the most commonly used tools are line drivers and receivers. It is difficult to set up a network with smooth data transfer if there is noise, ground level differences, mismatch of impedance and other dangers present. There are organizations like Electronic Industry association (EIA) and Telecommunication industries Association (TIA) that set the standards for the production of cables and other tools used in setting up of network. This ensures compatibility between devices provided by different manufacturers, and allows for better and smooth transfer of data over long routes and also for improved data rates. Earlier EIA suggested use of the prefix RS before cables, and hence they were labeled as RS232 and RS485. RS only meant Recommended Standards, but the system now adopted is to use the prefix EIA instead of RS. Data transfer is broadly classified as single ended and differential. RS232, which was meant for single ended was launched in 1962, and despite its limitations, has remained in use till today. RS232 allows for data transfer at relatively slow speeds (up to 20K bits/sec) and short distances (up to 50 ft). When data transfer has to take place over long distances, and also at a faster rate, single ended methods prove to be inefficacious. This is when differential data transmission comes into picture as it provides superior performance. These signals negate the bad effects of ground shifts and induced noise signals on a network. RS422 was produced to meet such requirements, but over time it has been found that RS422 cannot be used to construct a true multi point network. Enter RS485, which meets all the requirements of a truly multi point network. RS485 specifies up to 32 drivers and 32 receivers on a single bus. RS485 drivers are also capable of handling the problem of data collision and bus fault conditions. There are many differences between RS232 and RS485 and signaling mode is prominent among them. Whereas RS485 is balanced, RS232 is not balanced. 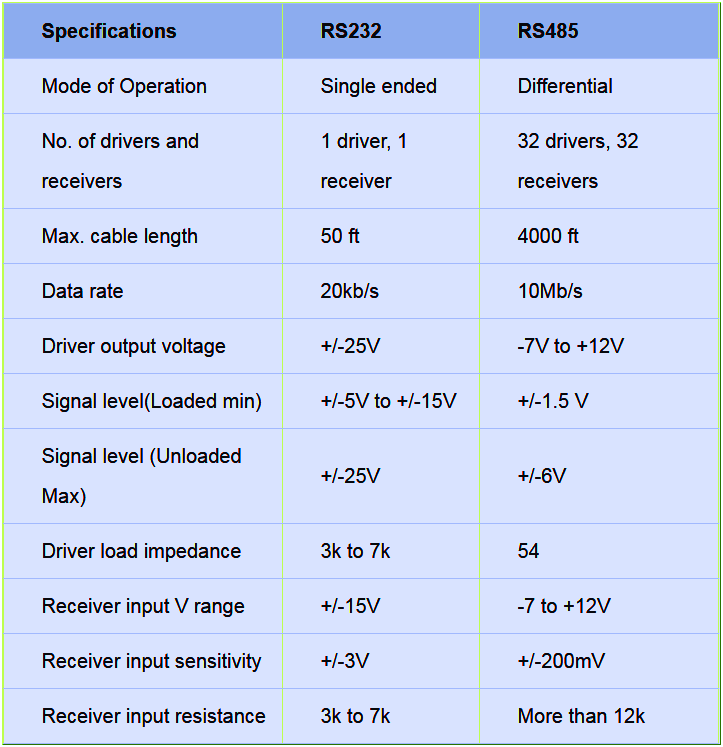 Here is a look between the specifications of RS232 and RS485 which tell the story.